Hello loves! Today I'm sharing with you all a few of my favorite fall items that are all on sale right now! These are all things that I've bought over the last couple of weeks... They're good basic items to have in your closet and you can wear them all right now. 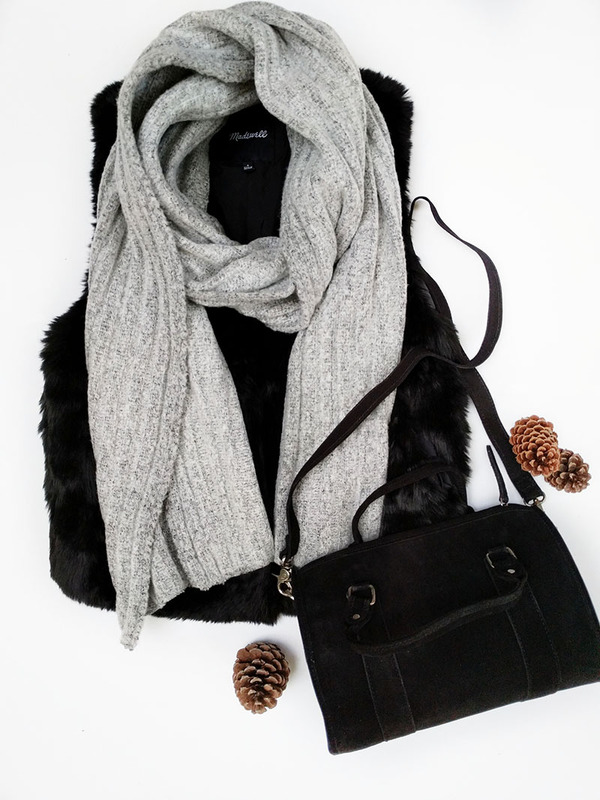 First up is a soft and cozy grey scarf. If you're obsessed with scarves like I am then you can never have too many. Scarves are one thing I'm almost always wearing throughout the colder months. This one is at a great price and I love the ribbed knit fabric. Next up is a faux fur vest. I love how brown faux fur vests look but I went with black because it's timeless and you can never go wrong with black. It's really great quality, I love the cut, and the faux fur material is SO soft! You just have to feel it haha! It's super discounted right now so if I were you I would order one right away. For size reference, I went with a size small. Last, but certainly not least is a suede bag. I love wearing accessories and clothing items made from suede during fall and winter. I bought it to use as my everyday, casual bag. It's the perfect size to fit all of my essentials (including my dslr) inside comfortably. Most of you probably don't carry a camera around but just in case you do - it will totally fit inside. I'm on the hunt for the perfect grey scarf! I love this one that you have! Thank you :) I'm glad you enjoyed this post!